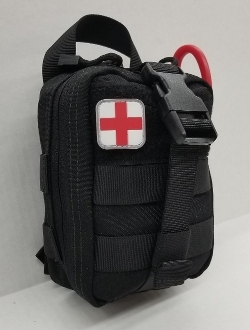 This comprehensive kit gives the First Responder the tools to deal with injuries related: to serious bleeding (including gunshot wounds), chest wounds, scrapes, abrasions, breaks/fractures, etc. The contents themselves are individually packed and sterile with instructions on the packaging. The items in this kit are currently in use with the US Military and are battlefield proven. (1) Combat Medic Tape --can be used to make chest seals, wrap wounds, etc.